Christmas is such a festival of shopping that it's time for another display post even though I just did one last week. I've got more holiday stuff, including the sort of polish-y things that only show up at this time of year, as well as some core colors developments that I don't want to put off sharing. But first I have a couple variations on displays I've already shared. 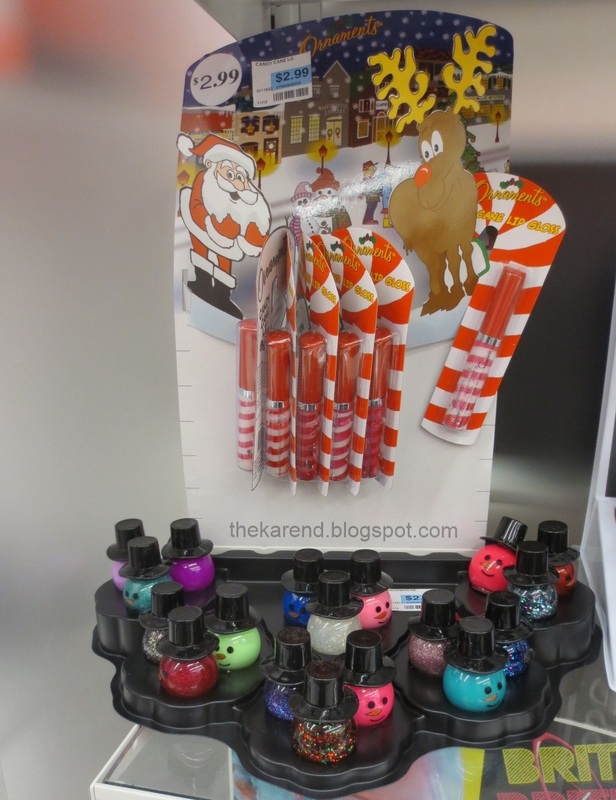 Target had their Nicole by OPI holiday Kardashian Kolors were in a wide endcap shelf display along with some of the previously released Target exclusive colors. 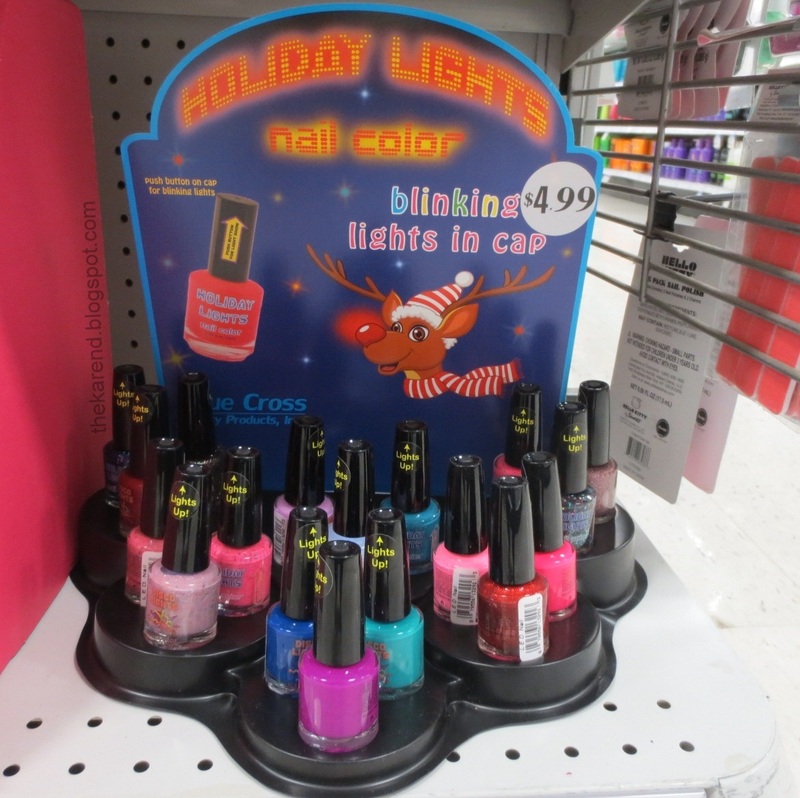 Walgreens had a sidekick from Sinful Colors with makeup on the top and polish on the bottom, including the holiday glitters that previously I'd only seen in a shelf display on their own. 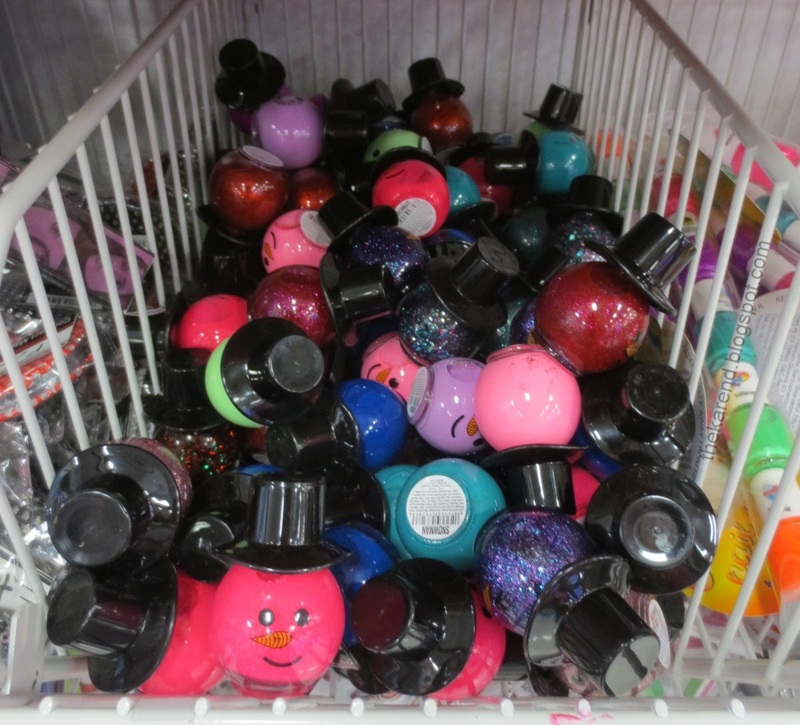 Snowman polishes from Blue Cross are a winter tradition, and this year is no exception. 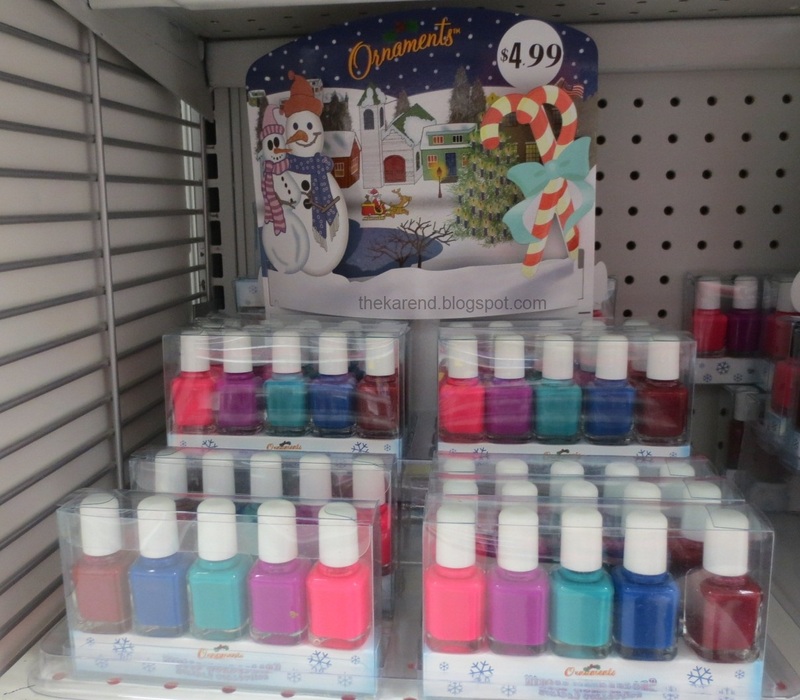 Rite Aid has them in a display branded with the name Ornaments along with candy cane lip gloss. Meijer has them in a most pit in the stocking stuffers section of the holiday aisles. This year, for the first time I can recall, there are Sally Girl branded snowmen at Sally Beauty. 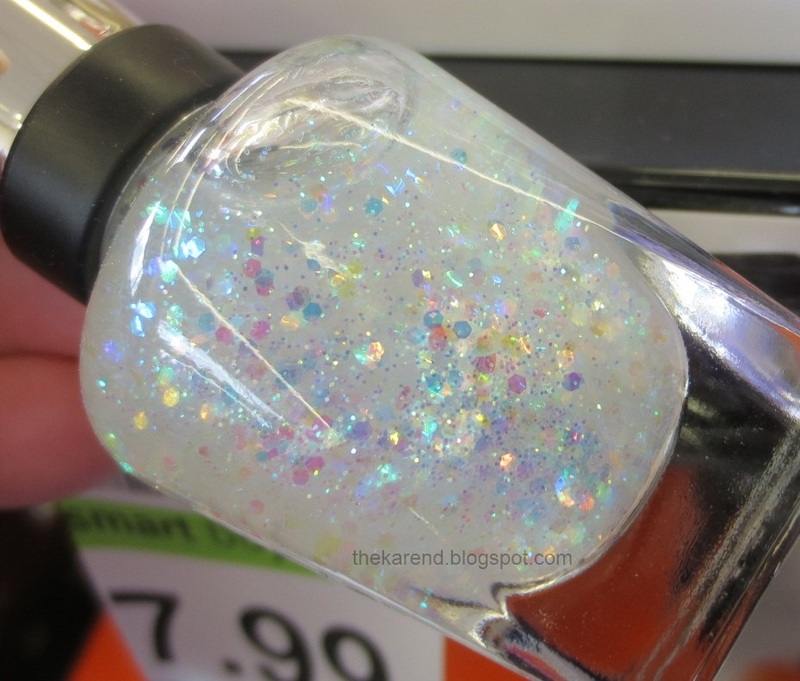 I've only seen two colors, a red microglitter and a pinky pearl shimmer. They look exactly the same as the other ones, but they're priced at $1.99 versus $2.99 at Rite Aid. With a price like that, I wish they had more colors. 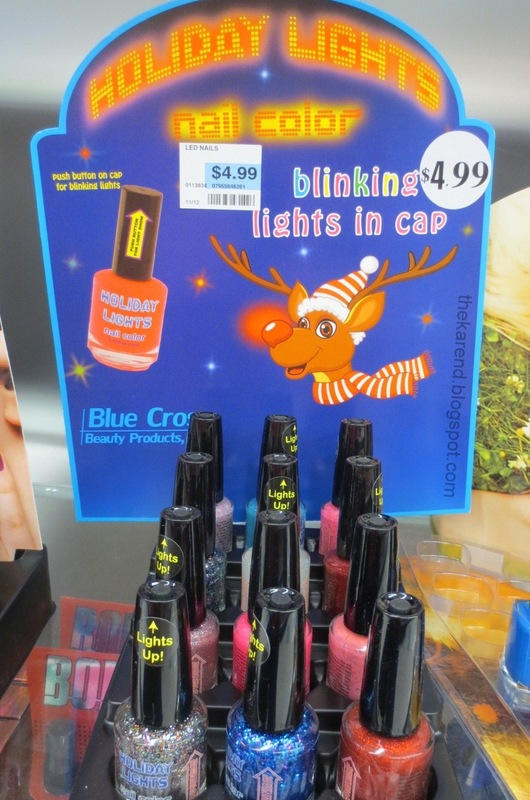 At Halloween, Blue Cross gave us Disco Lights polish with a blinking light in the cap. The concept confused me then, and I'm no less confused by Holiday Lights, which is the same thing but with different colors of polish. Who's going to see my blinking lights? If I turn it on and it's blinking while I'm trying to paint, won't that be distracting? Instead of glow in the dark colors that were on offer at Halloween, these are glitters and brights. I've seen two display versions of these at different Rite Aids. 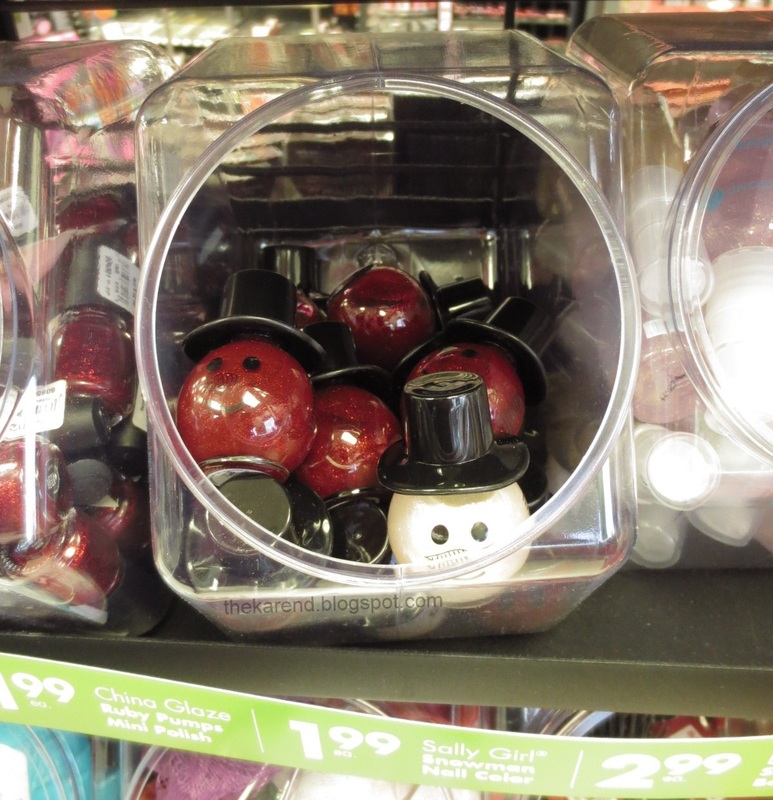 Some of the same polishes that are in the snowman and blinking bottles can also be found in the Ornaments mini sets. 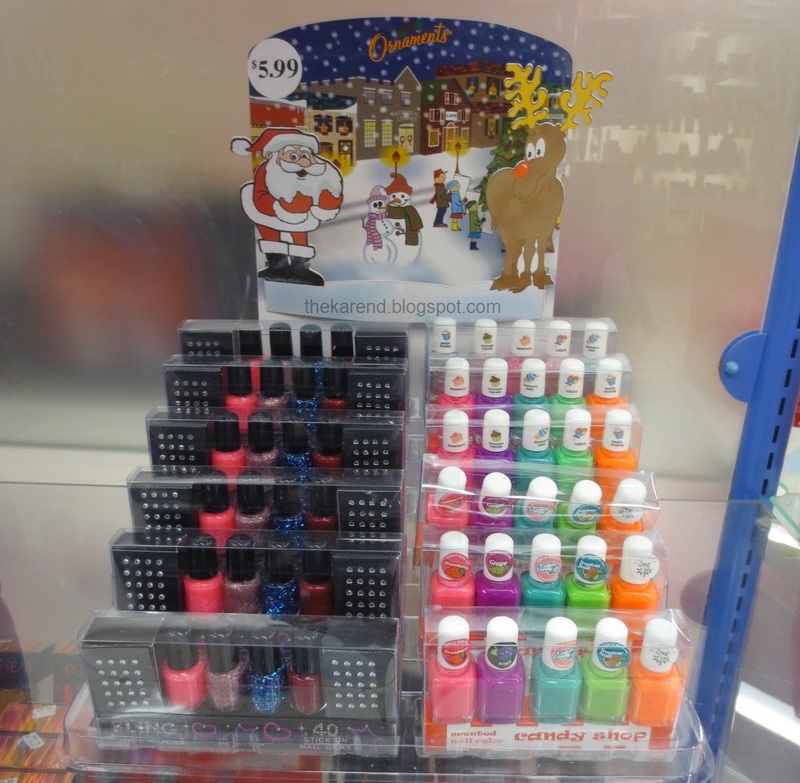 There's a bling set with four glittery polishes in rounded bottles and rhinestones for nail art. 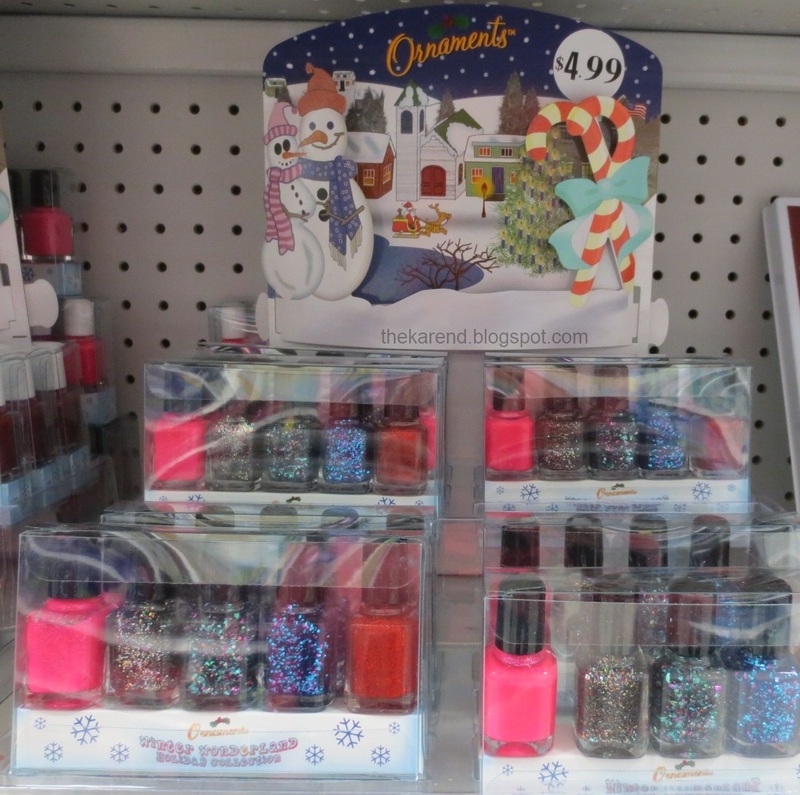 Those four polishes show up in squared bottles with a fifth glitter in another set. If you're not into glitter, there's a set with cremes (three of which look liek summer colors to me, but a little brightness in winter never hurts). 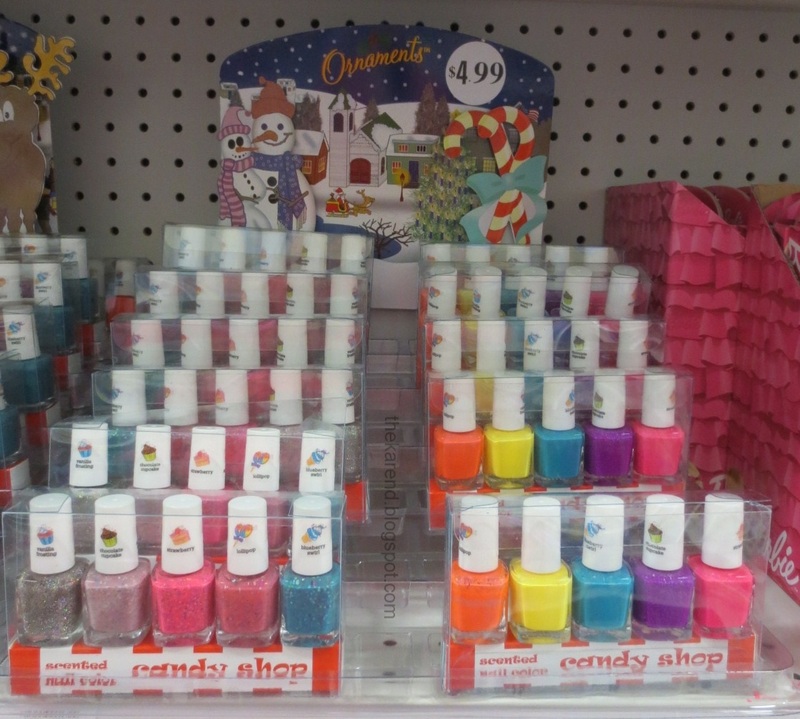 If you like scented polishes, there are a few different Candy Shop sets: bright colors in two different sets of five as well as a scented glitters quintet. 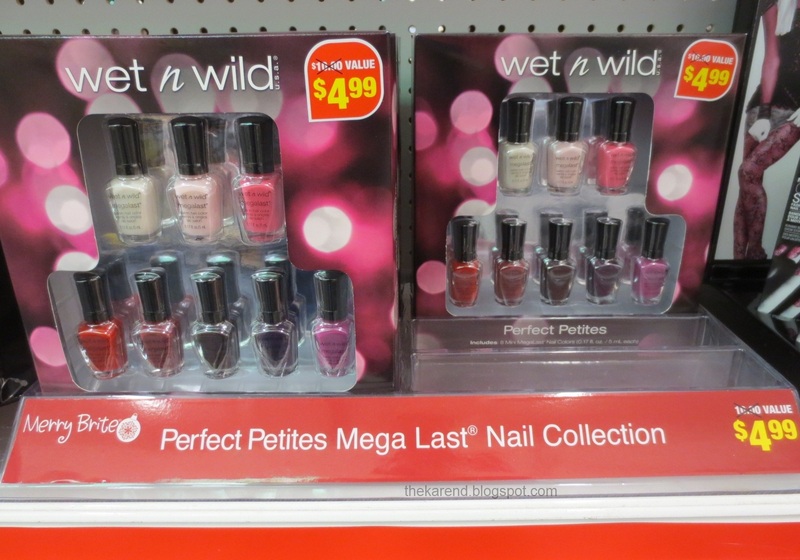 Wet 'n' Wild has few sets out for the holidays, too. There's the Perfect Petites, eight mini bottles of Mega Last with a bottle shape that mirrors the full size ones that we got with the relaunch (earlier this year? I don't even remember). 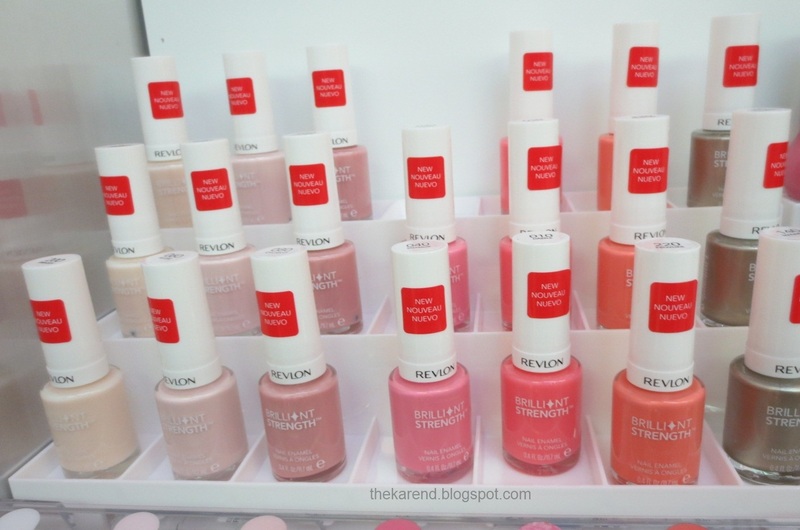 These are classic whites, pinks, and reds; most (all?) are creme finishes. 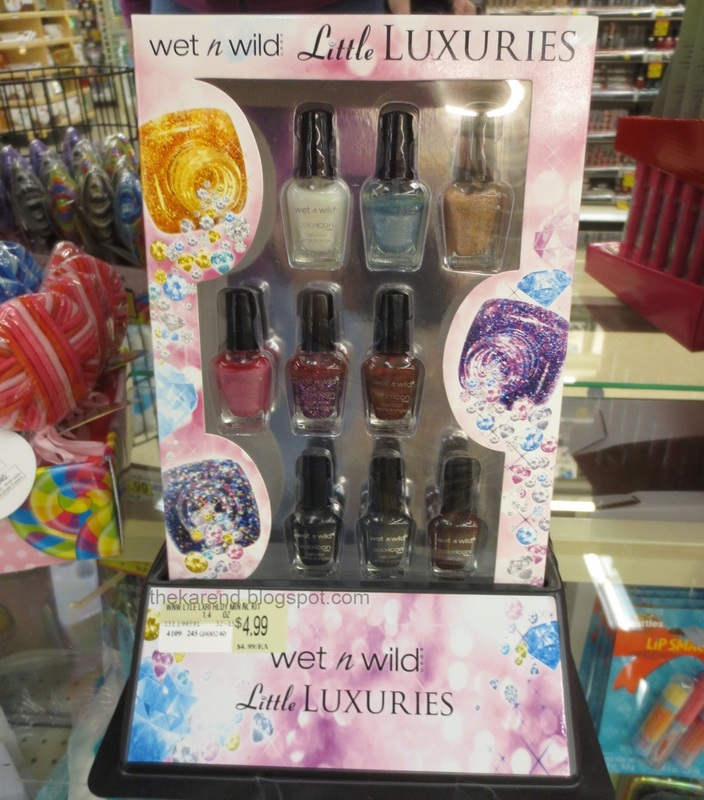 For the slightly more adventurous polish lovers on your gift list, there's Little Luxuries, a set of nine Wet 'n' Wild Color Icon minis. 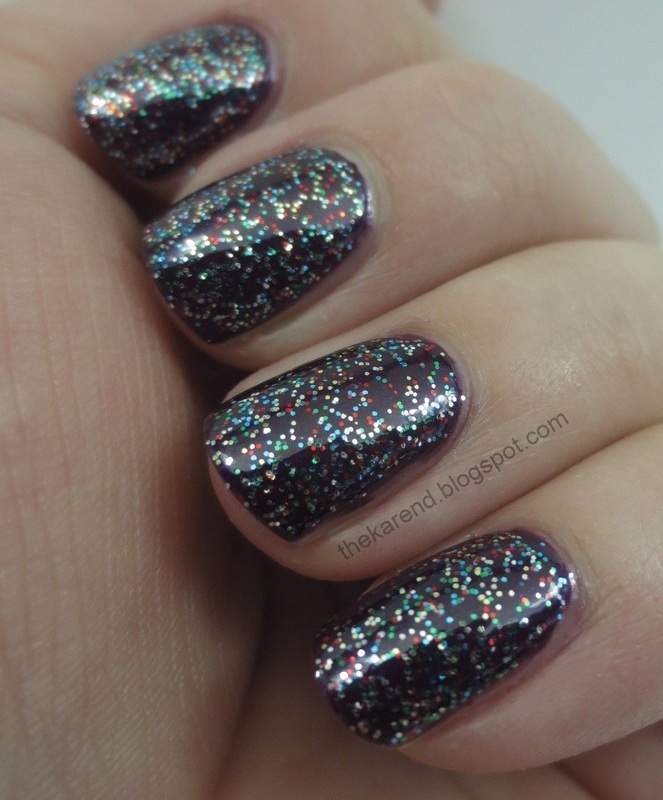 This has mostly shimmers (and one glitter) in a range from light to dark. 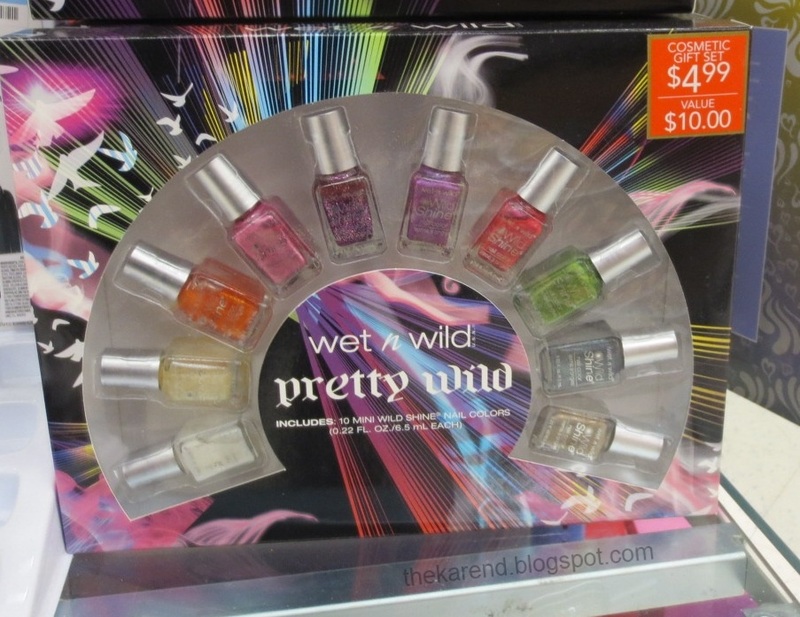 Rounding out the min sets I've seen from Wet 'n' Wild, there's Pretty Wild, a set of ten Wild Shine minis in squared bottles. These are mostly (all?) shimmers, with brights like orange and lime green included. 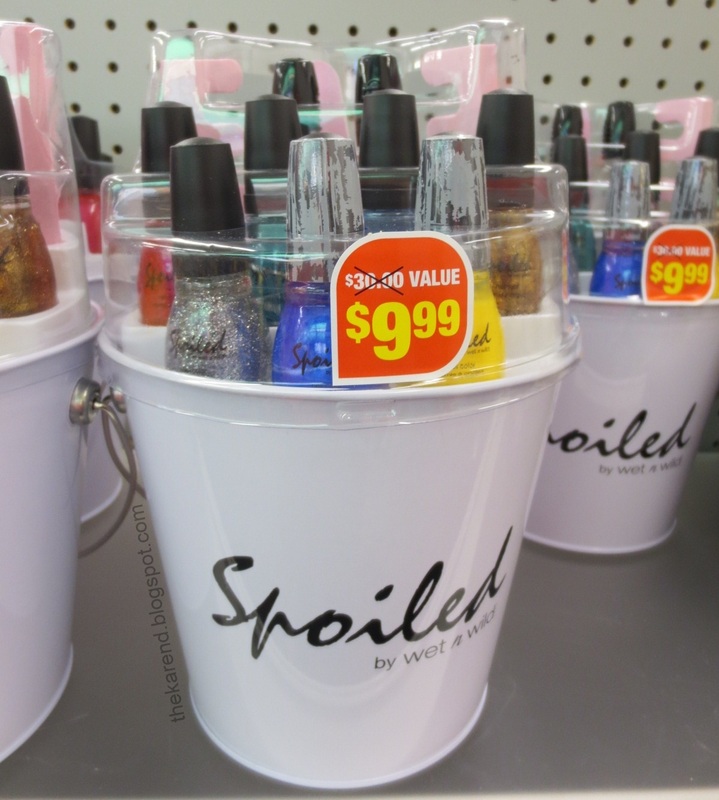 In the category of full size sets, CVS has a Spoiled by Wet 'n' Wild bucket, which contains seven Spoiled polishes, two clear Wet 'n Wild Fast Dry ones, toe separators, and a file. Two of the Spoiled have crackle overwraps on their caps, which is odd because I never saw Spoiled crack before. I'm not curious enough about it to buy a whole bucket just to try it (though if these go on a big sale, I just might bite). The bucket packaging made more sense to me when they did it in the summer—you could paint your toes and take the bucket to the beach to play. 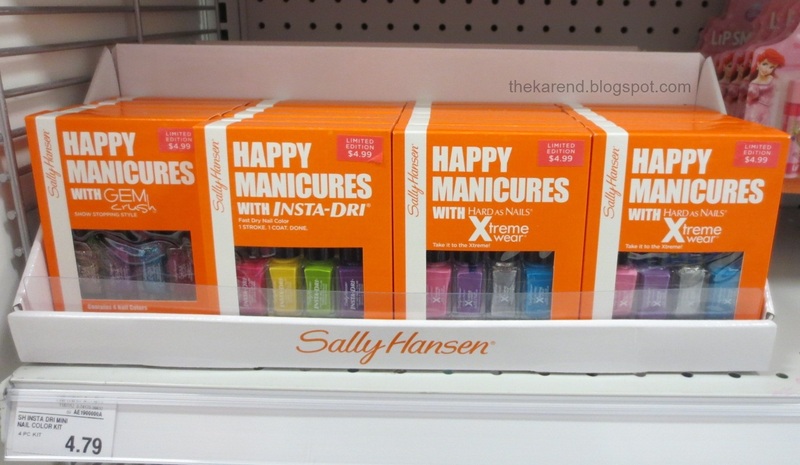 I've seen three mini sets from Sally Hansen: Gem Crush, Insta Dri, and Xtreme Wear. At Ulta, they have an exclusive OPI mini set with three shimmers (red, green, and purple) and a RapiDry top coat. The color names are Last Minute Shopper, Skip the Gift Wrap, and Gift Cards for Everyone, though I don't know which names match with which shades. I expect there'll be full size bottles of these showing up at some point, but they weren't in the store when I was there last. 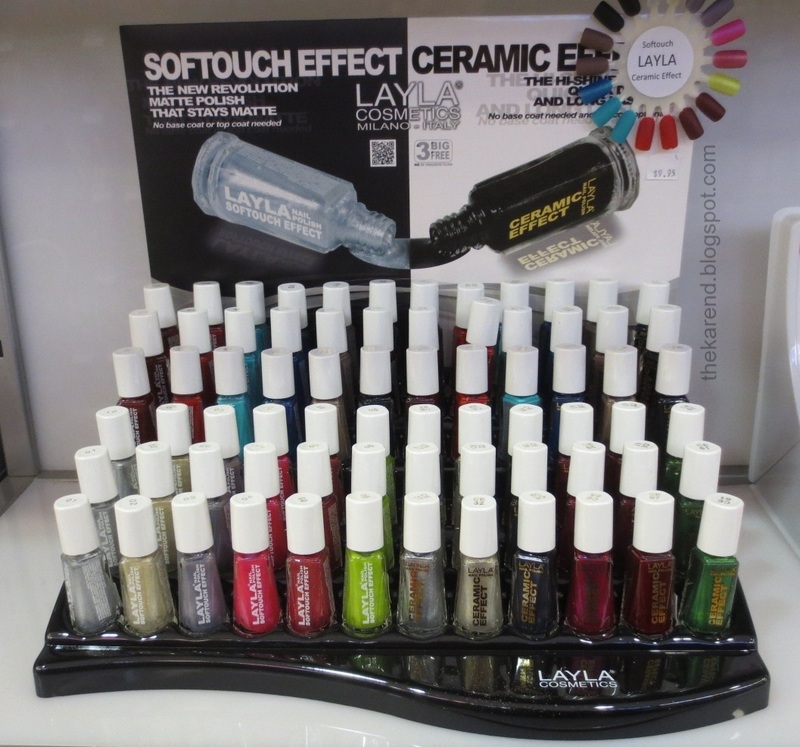 Also at Ulta, I saw something that made me very excited: a Layla Ceramic Effect Display. 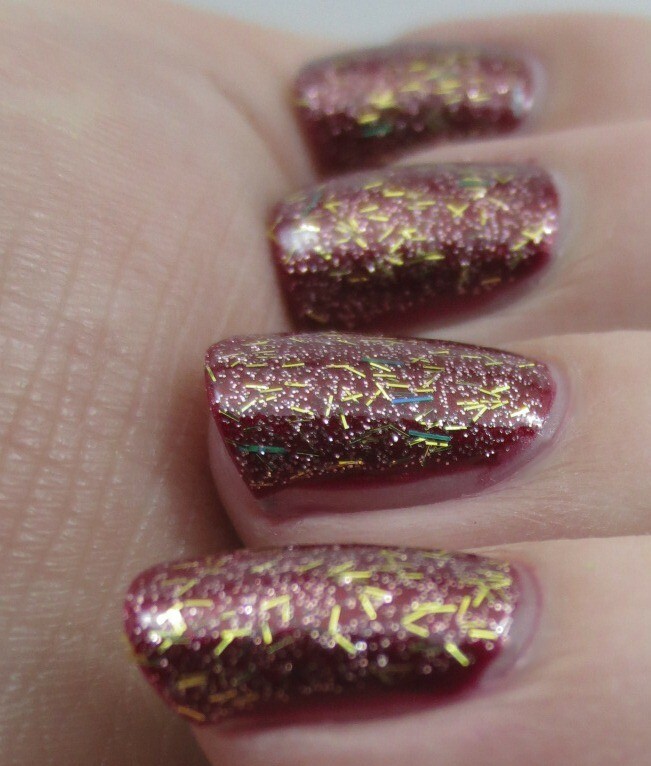 It's called Christmas in Laylaland and has five blingy glitters and flakies. I couldn't find any names on them, but I did buy one of every color so I could look more closely later. On a different shelf in the same Ulta, I saw another Layla display. This was half Softouch Effect and half Ceramic Effect. There were twelve colors from each line. I don't know the names of these, either, but I just couldn't justify buying one of each for research purposes. Not all at once, anyway. 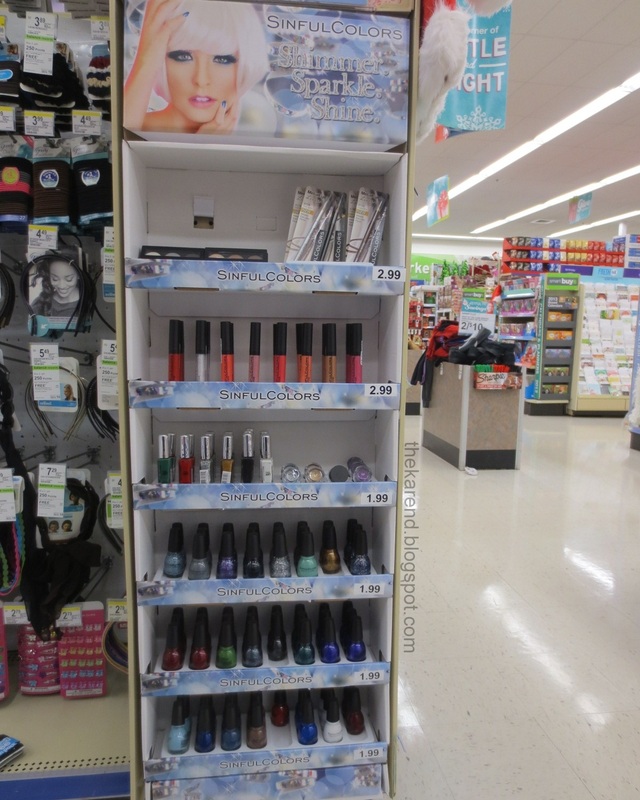 While I was in Illinois for Thanksgiving, I stopped at a Walgreens and saw a Sally Hansen Complete Salon Manicure display that gave me my first look at the relaunched line (see Nouveau Cheap for more on that topic). The display looked fresh, but there were slots for two colors entirely empty. 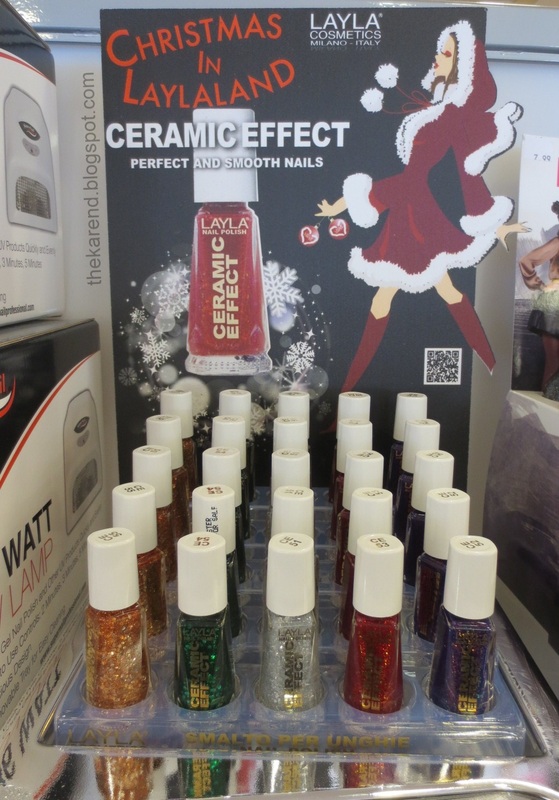 Given that the displays for Lustre Shine were short two colors, I was not too surprised. There are several blues and greens on the photo on the display, but none in the display, so I guess this is only part of the relaunched line. Some of these looked like old colors with new names, some were old colors with the same names, and some were entirely new. I want to try and sort all that out at some point, but not now. Now I will just tell you what these bottles were called. Front row, left to right: Wedding Glitters, Gilty Party, Snow Globe, Hi Ho Silver, Clear'd for Takeoff, Debut-tint, Sheer Ecstasy, Shell We Dance?, Arm Candy. Middle row: Pink Pong (what? ), Mudslide, So Much Fawn, Raisin the Bar, Plum's the Word, Commander in Chic, Greige, Almost Almond, Earl Grey, Gray-t Escape. Top row: Back to the Fuchsia, Rosy Outlook, All Fired Up, Red My Lips, Wine Not, Ruby Do, Trouble Maker, Pat on the Black. The most interesting of these was Snow Globe; oh, I need to try layering this over many things! Then, back at home earlier this week, I came across something in a CVS that nearly made me hyperventilate. I don't expect much from CVS in the way of new polish this time of year because in most stores half of the special display space is taken over by Christmas candy for the last two months of the year, but I keep checking just in case. This time, I was rewarded. 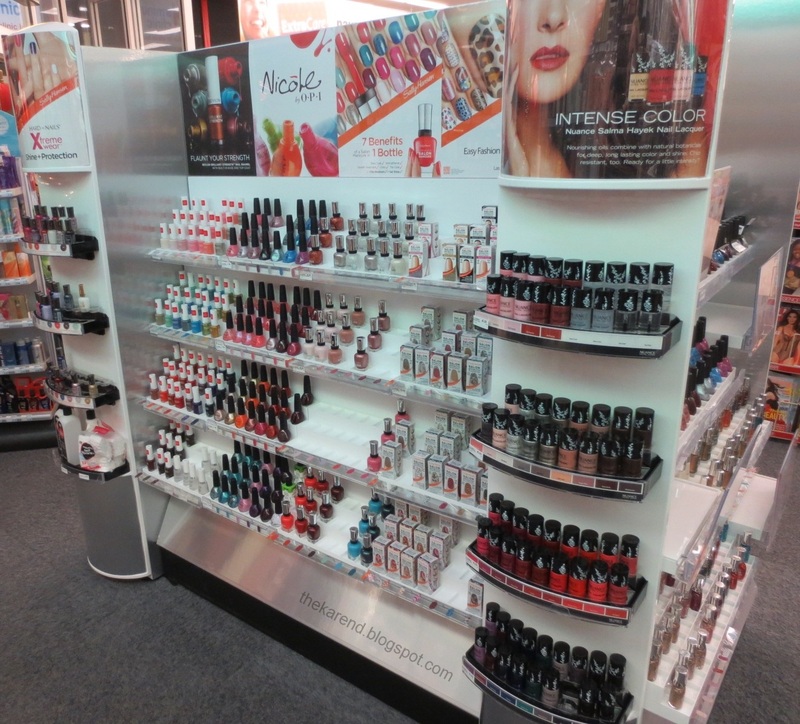 There was a giant white display called Nail HQ where there used to be a normal shelf unit. This had nail stuff on all four sides. If that wasn't enough, some of it was stuff I'd never seen before. If it hadn't been ten minutes before the store closed, I probably would have taken off my coat and settled in for a long photo session to document everything in detail. As it was, I had to content myself with taking a series of quick shots as I circled it like a moth around a porch light. The first side I came to was all Essie. 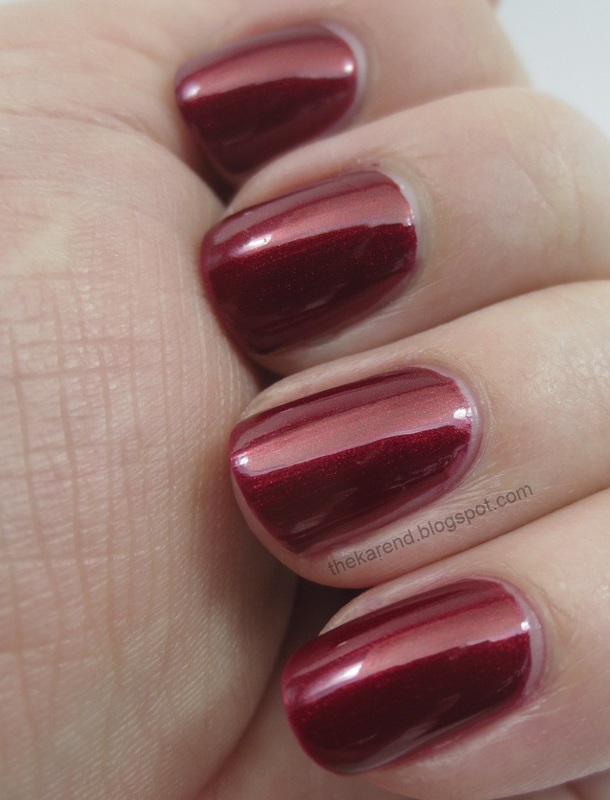 The side around the corner to the left of the Essie was gel and supplies. There was Nutra Nail Gel Perfect, Sally Hansen Salon Gel and Insta Gel Strips, and Sensationail, along with remover and files and such. Continuing around to the left, the other short side was Nicole by OPI, including a new set of CVS exclusives I hadn't seen in person before (in the second section from the top), and Sally Hansen Lustre Shine and Gem Crush. Then there was the last side, with the most new stuff. 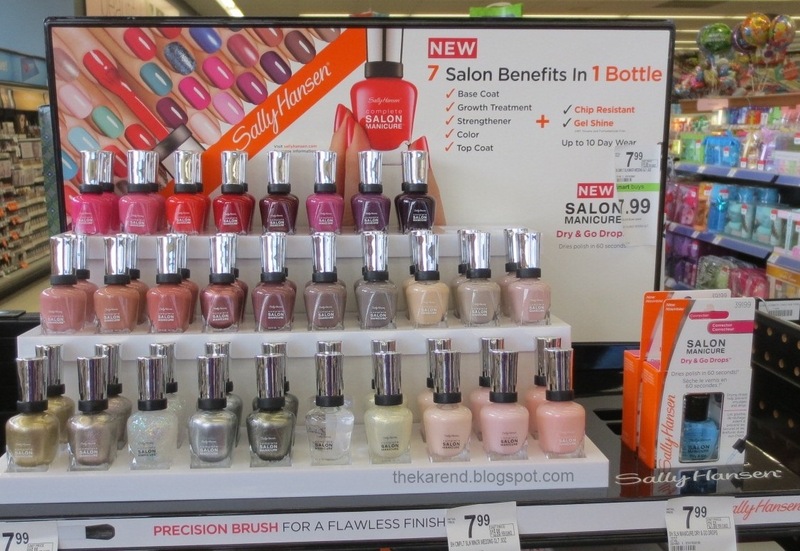 The Sally Hansen Xtreme Wear on the left end wasn't anything crazy special, but the big center section had a whole Revlon line I'd never laid eyes on: Brilliant Strength. Next to that was more Nicole by OPI, then it was Sally Hansen Complete Salon Manicure, with slots for what might be the whole relaunched line—too bad so many were empty. 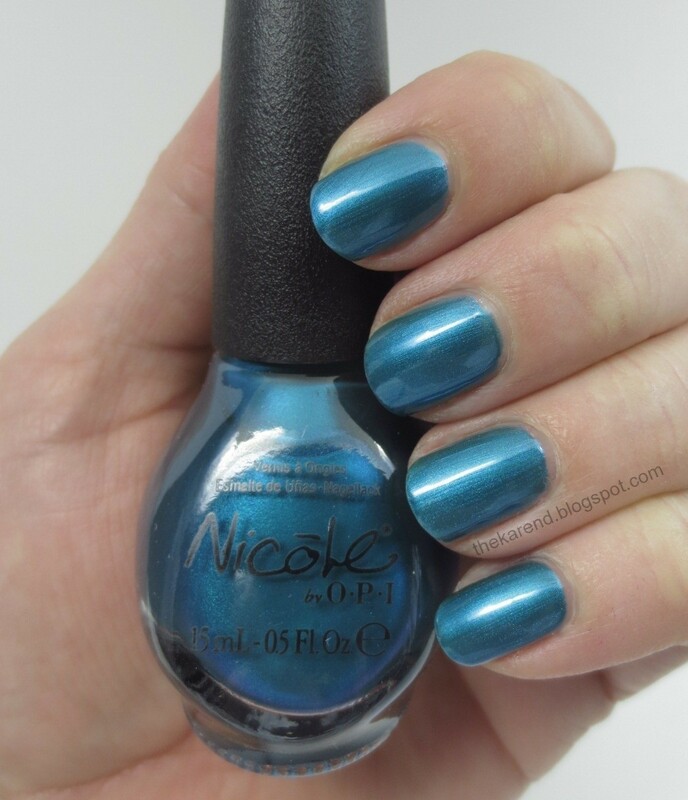 There was a bright blue called Water Color and a deep green called Black and Blue (yeah, blue, but it looked green to me) and a glitter called Copper Penny. 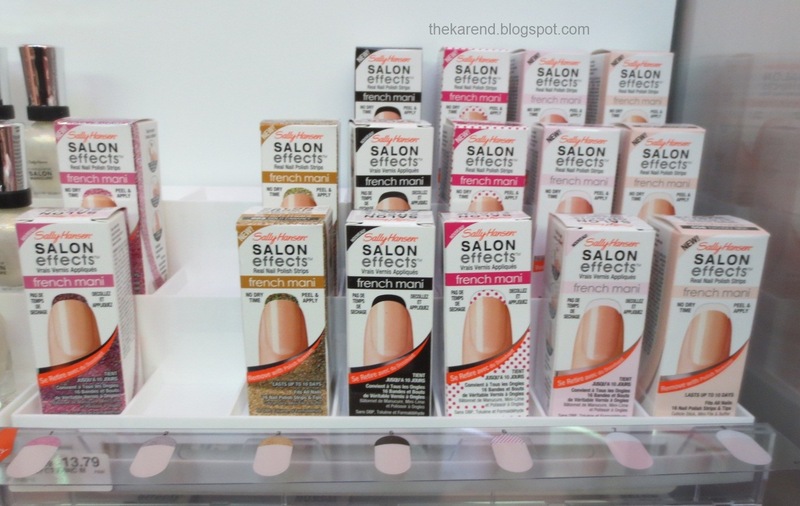 Next to that was a section of Salon Effect strips, including some French Mani ones that were new. Finally, another whole new line from Nuance by Salma Hayak. 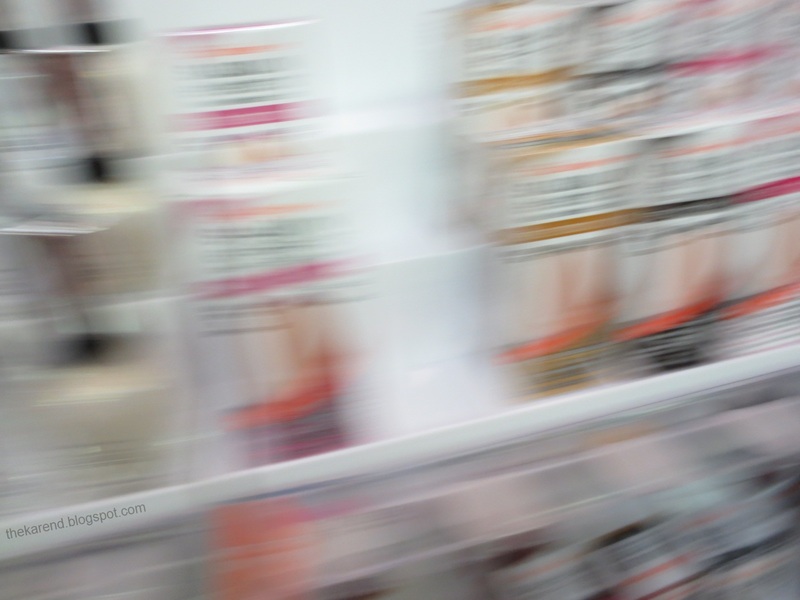 I was so hyped by all this visual input that some of my photos came out like this, I was moving so fast from shot to shot trying to take as much in as I could before they kicked me out of the store. I didn't buy anything from the new brands—yet—but I did get some of the French mani strips to try and a couple of the Complete Salon colors that were new. When I'm going to find time to try them with all the other stuff I want to do outside of work, I'm not sure but they'll keep. 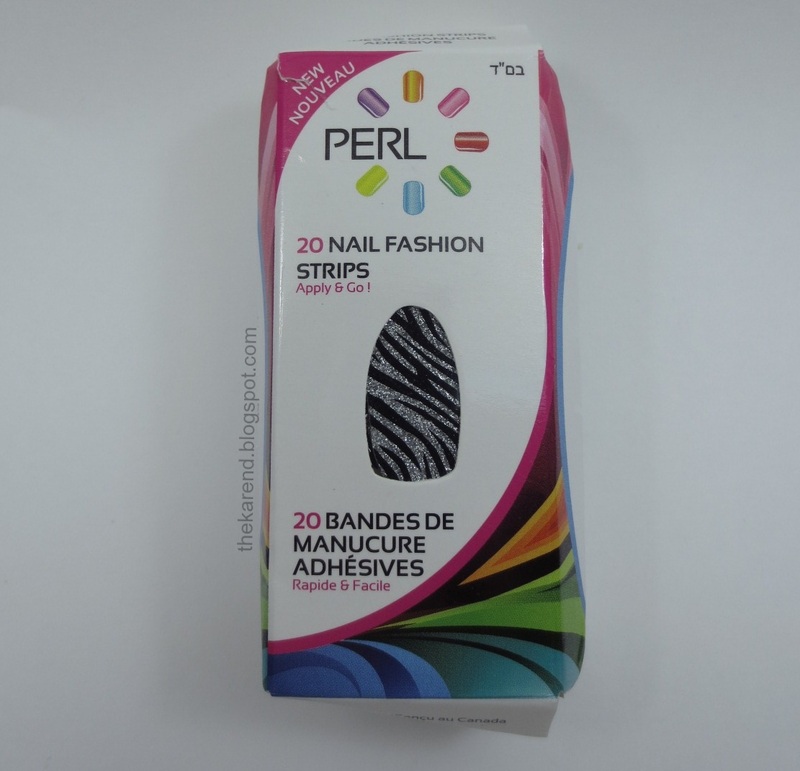 I got the opportunity to recently to review some full nail stickers from Perl. 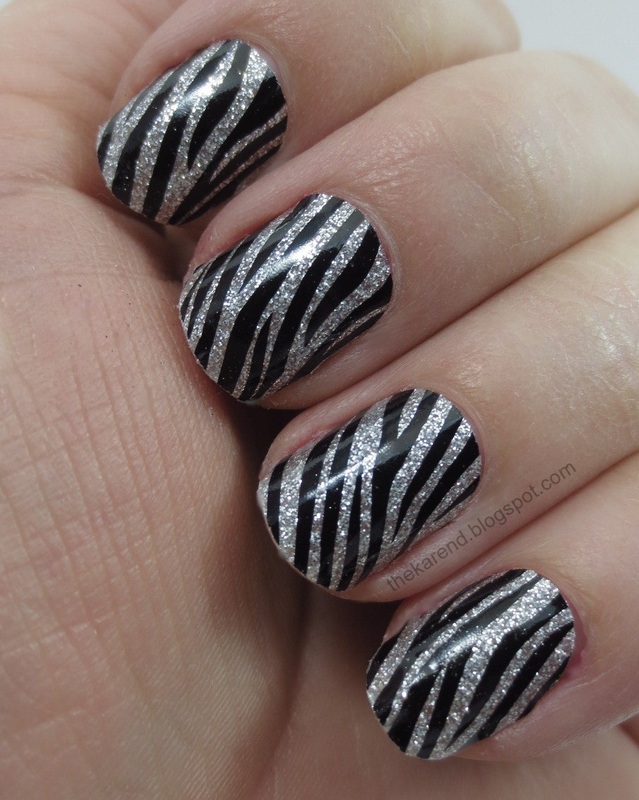 The design they sent was Zebra-tude, a zebra stripe in silver glitter and black. Somewhere on its journey from Canada, the box got a little crushed, but the contents were fine. The box has 20 strips total in two sealed packs, a mini cuticle stick, a file, and instructions. 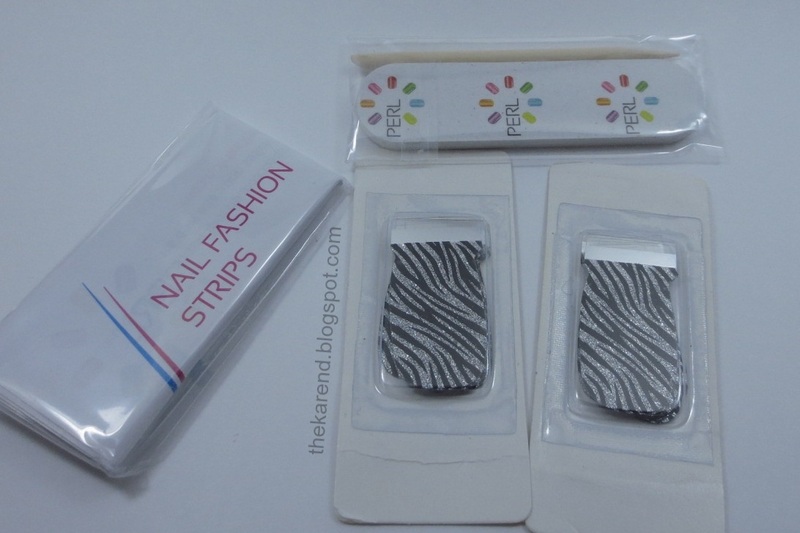 The application process for these is basically the same as for the Sally Hansen strips: pick the right size of strip, remove protective backing and top sheet, smooth onto nail, remove the excess strip with the file, use the flat end of the cuticle stick to make sure the edges are stuck down. The Perl strips are thicker than the Sally Hansen ones but thinner than some other nail stickers I've used (like Essence Studio Nails). That thickness makes them a bit easier to handle than the Sally Hansen ones, as I wasn't worried about them folding into themselves and getting stuck or tearing if I pulled too hard (though it's been a while since I had those issues with the SH as I've got so much practice with them now). I've got fairly curved nail beds, so I was a little concerned the thickness would mean it was harder to bend them to conform to my nails, but it wasn't an issue. To make extra sure they were secure, I blew hot air from my hairdryer on my hands for a few seconds to make the strips more pliable and then smoothed them down real well. These wouldn't be as easy as the Sally Hansen cut in half and use one strip for two short nails, as the end of the strip closest to the tab is not perforated in a curve the way the SH are, but since there are 10 strips in each pack (compared to eight for SH) that wasn't a problem. I've still got a full pack of 10 left for next time. After four days of wear, these were holding up pretty well. I had no lifting of the strips or rips or chips at the edges. I did have some tipwear and the glitter was starting to show through the black in a few spots, but that last part almost looked intentional, like it was sparkly stripes on a more sparkly background. The directions said to peel these off, which made me nervous because I worried about some of my nail going with the strip, but I worked slowly and carefully and when I was done, my nails looked fine, without any of that whiteish roughness I associate with peeling damage. I haven't seen these strips in stores by me yet. They are available online direct from the Perl Fashion website. They're regularly priced at $9 (Canadian) a box; right now, all the designs I looked at are on sale for $7.70, with free shipping to the United States or Canada between now and the end of this year. I actually just ordered two boxes—a black and tan lace design and a pink jeweled dot one that looked intriguingly sheer (I've layered polish over strips before but not vice versa so I'm curious about that). The strips shown in this entry were provided free for review purposes. The content of the entry was not dictated by the provider. Yes, another week with no Nail Wheel Wednesday—I think it's unlikely it will return before 2013, though I still might get ambitious and slip some wheels in on weekends. Today I've got the six colors in the NOPI Kardashian Kolor holiday collection (or maybe it's a "kollection"), three shimmers and three glitters. I've stated my lack of enthusiasm for the bottle shape before, so let's just move on to what's inside, starting with the shimmers. All of these shimmer swatches are two coats, no topcoat. 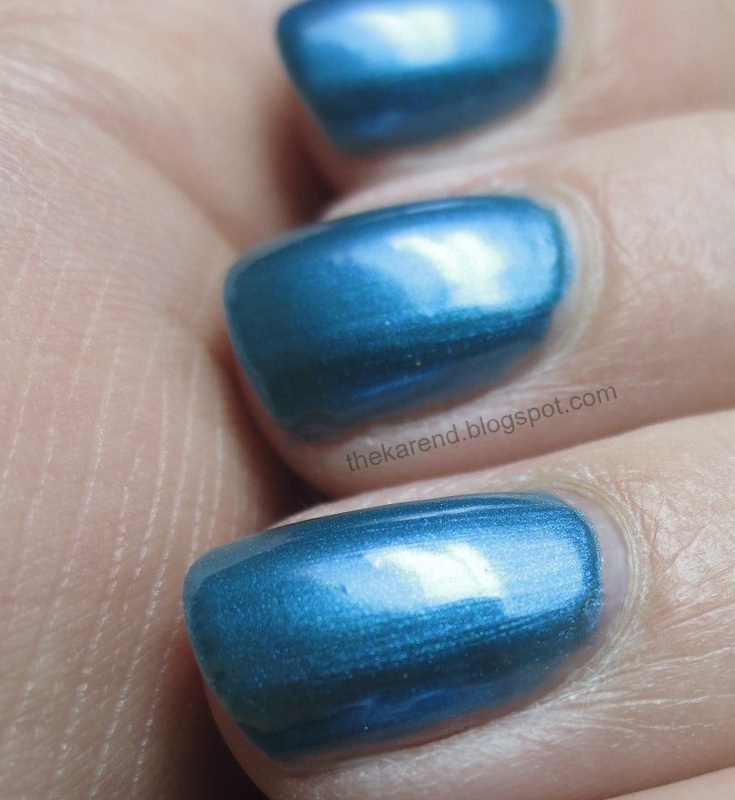 Deck the Dolls is a turquoise blue shimmer. In low light, Deck the Dolls does have a nice glow to it. 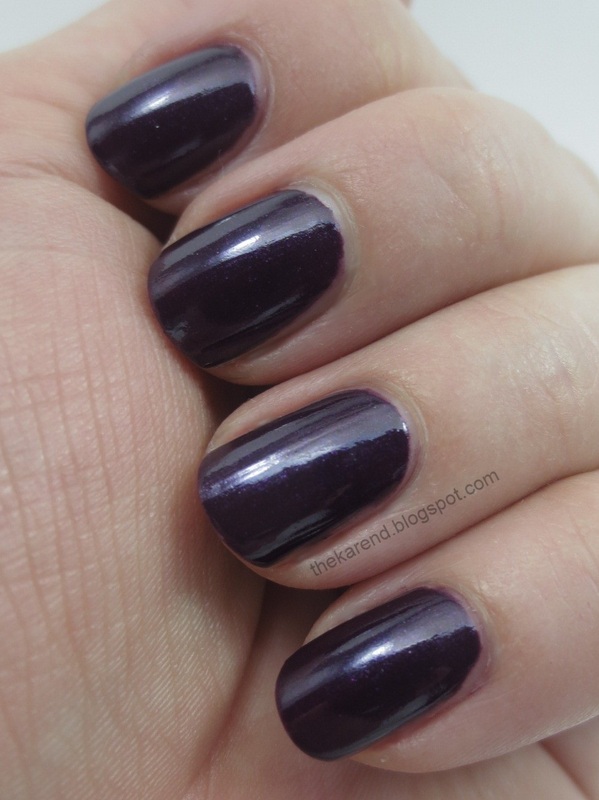 Here We Kome A-Karoling is a deep purple shimmer. I see now, looking at the photos, that this could have really benefited from topcoat. 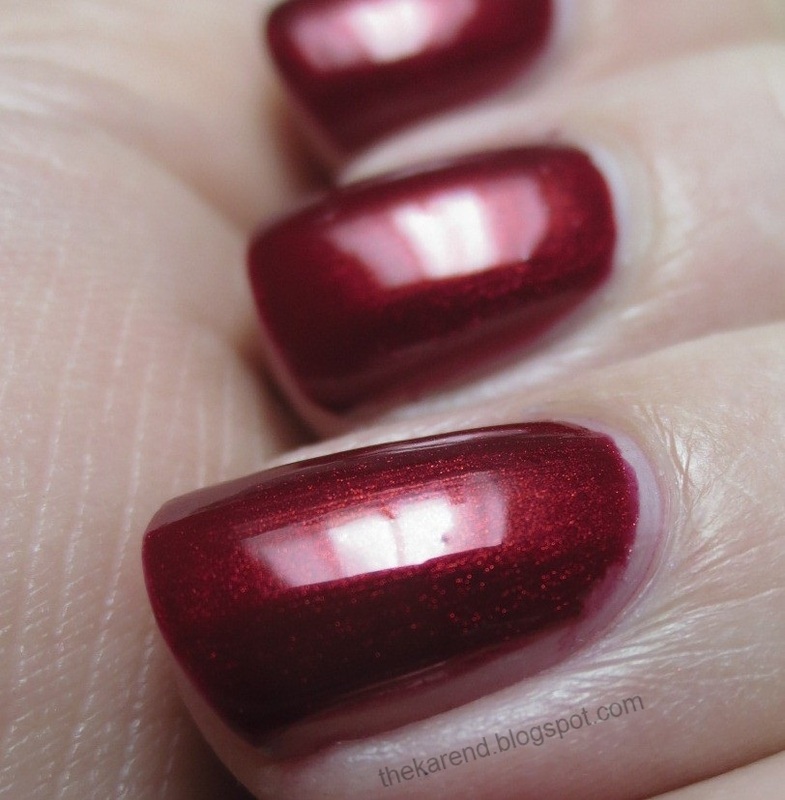 Keeping Up with Santa is a rich red shimmer, the sort of thing I'd most expect to see in a holiday collection. Now let's move on to the glittery half of this group. All is Glam All is Bright is a very dense conoction made up of small particles of silver, red, and ice blue glitter. This can most definitely be worn on its own; I stopped at two coats when swatching it, as the coverage was fine at that point. Even without topcoat, it's not too bumpy, and I rather like the semi-matte look of it on its own. 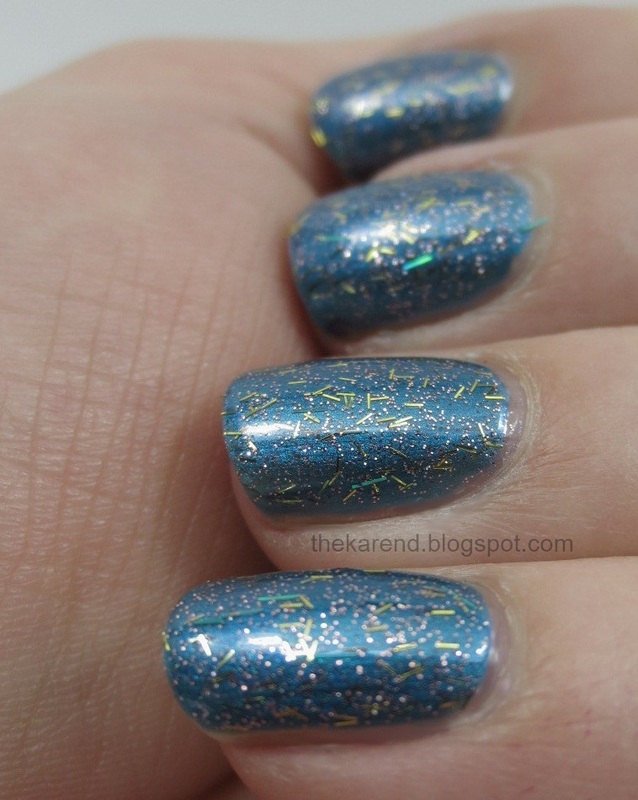 Kardashing Through the Snow is a mix of small glitter in blue, green, red, gold, and silver that looks dense in the bottle but is no match for All is Glam All is Bright in the coverage department. I used two coats of it over Here We Kome A-Karoling, and it seemed pretty shiny even without adding topcoat. I saved the oddest for last: A Gold Winter's Night. 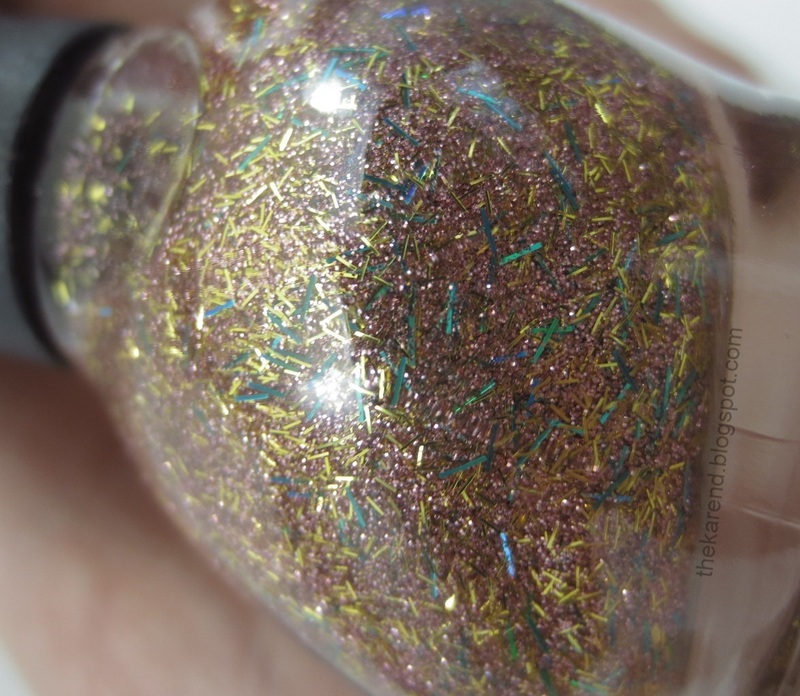 This is a fine rose pink glitter with gold, green, and blue stringy bar glitter scattered about, all in a clear base. I've seen swatches of this worn alone at three (or was it four?) coats but I thought that would probably be too much texture for me, so I tried layering two coats over Deck the Dolls, to complement the blue in the glitter. The pink glitter stood out nicely on the blue background and the green and blue bars blended in, which made it a less "fuzzy" look overall than I'd expected. I also tried A Gold Winter's Night over Keeping Up With Santa. 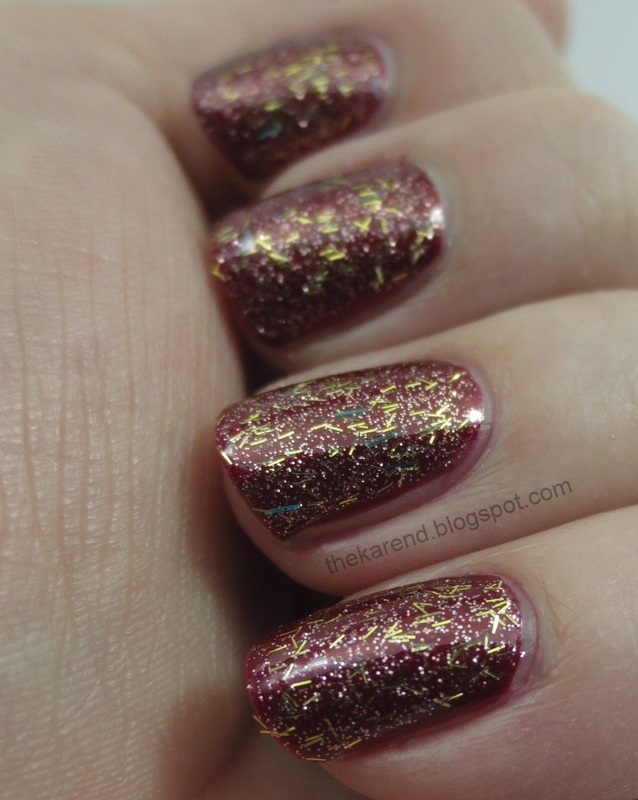 A Gold Winter's Night is definitely the most interesting of these glitters. Kardashing Through the Snow is more wearable for me; I can see layering it over lots of different colors. Keeping Up With Santa is my favorite of the shimmers; it's just so full of glow.